Prior to European settlement, the Northern Mixed-grass Prairie was a mosaic of wetland, grassland and grass-shrub habitats, with riparian and floodplain forests along major drainages. Even today, the physiographic area can be characterized as being one of the largest still relatively intact grassland landscapes that persist in North America. It is the continent’s most important production area for waterfowl and is the heart of the breeding range for some of North America’s rarest species of grassland birds. A comparison of relative abundance estimates among physiographic areas sampled by the North American Breeding Bird Survey indicates that more than 40% of the world’s population of Baird’s Sparrows, 30% of Nelson’s Sharp-tailed Sparrows and 25% of Sprague’s Pipits are found in the physiographic area during the breeding season. Population objectives are to maintain or increase the abundance of all species in the grassland species suite. 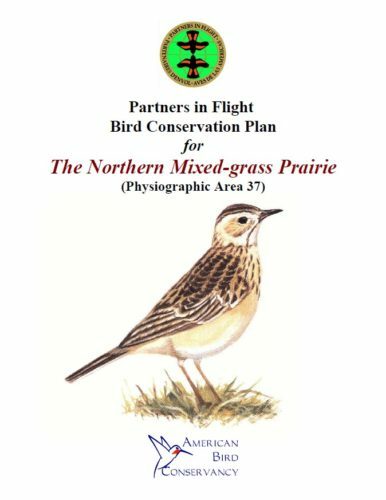 Because many priority grassland species have relatively large area requirements and large home ranges, habitat strategies include securing existing landscapes where native prairie exists in abundance and focusing habitat management prescriptions on units of 100 ha (250 acres) or greater.